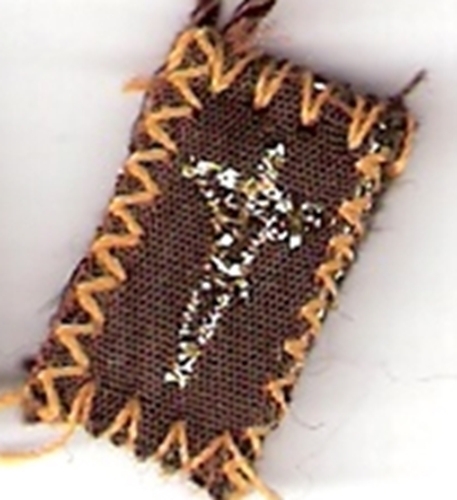 Tiny - 1/2" x 3/4"
A scapular is a garment worn by religious over the shoulders (scapula), and hanging down in front and back, usually to about the bottom of the habit. It developed as a practical garment, protecting the habit during work, and was in time invested with spiritual significance, consecration or dedication to God. 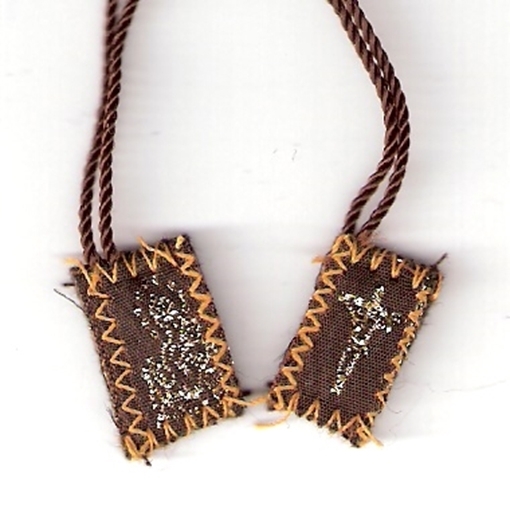 By analogy to the scapulars of religious, there are small scapulars that are derived from them which represent a particular devotion or spirituality, usually associated with a particular community. Such a scapular is two pieces of cloth (generally about an inch square), connected by cords and worn over the head. It often has a picture or a particular color, depending on the spirituality it stands for. 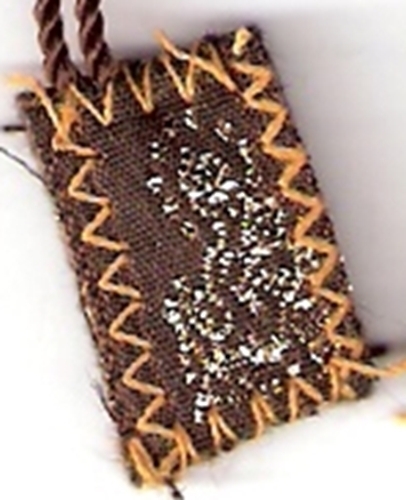 The best known and most highly esteemed scapular, and the one most favored by the Church, and by the Blessed Virgin in many of her apparitions, is the Brown Scapular of Our Lady of Mt. Carmel. 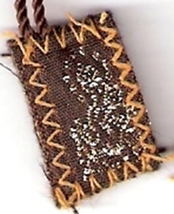 It is adapted from the scapular of the Carmelite Order and represents a special Consecration to Our Lady under the title of Our Lady of Mt. Carmel. Those who wear it practice it a special devotion to Mary. In the past this was the Little Office of Our Lady, but today this can be commuted by any priest to the rosary. In addition, the person has a special entrustment of themselves to Mary for their salvation. This, in fact, has been promised to those who faithfully wear the scapular: "Those who die wearing this scapular shall not suffer eternal fire." This must not be understood as superstitiously or magically, but in light of Catholic teaching that perseverance in faith, hope and love are required for salvation. The scapular is a powerful reminder of this Christian obligation and of Mary's promise to help those consecrated to her obtain the grace of final perseverance. Conferral with the scapular indicates a special devotion and consecration to Mary. No one should undertake it who is not spiritual prepared to live in accordance with it. The short form of investing or conferral consists of a priest or deacon taking a blessed scapular and while placing it over their head reciting with the person any Marian prayer (e.g. Hail Mary, Memorare, Salve Regina). The person is now invested. They don't have any lists to join, though they are henceforth members of the Scapular Confraternity and share in its spiritual benefits (the prayers of the members). No special daily practices are obliged, though someone consecrated to Mary, of which the scapular is THE sign, should live chastity according to their state and recite the rosary daily. There is also a long form in the Book of Blessings,chapter 46, which is very fitting for group investments. Every parish should have this ritual book. For some years the Carmelite Order had permission from Rome to grant laity the Indult to enroll people. This permission is no longer given, but those who received the Indult in the past still have it. So, while laity may not bless a scapular, there are some lay people who can invest others, with a scapular previously blessed by a priest or deacon. One final note, investing MUST be done with the cloth scapular. Those who wish to wear the medal can do so after investment. The scapular blessing attaches to each subsequent scapular. A new blessing is NOT required. This is not true of the medal, each of which must be blessed by a priest or deacon.